Pack Your Snack [And A Giveaway!] – CLOSED | hey, beth baker! I probably hear this eight to ten times a day. Seriously. One of the “drawbacks” of being on a real food diet is that our bodies are remarkably good at processing what we’re putting in them. And consequently, these children of mine are always asking for a snack. I don’t think it’s a bad thing to eat smaller meals throughout the day so I’m not one to only serve them at breakfast, lunch, and dinner [she said with a sigh]. But it does require me to carry food with us pretty much wherever you go. 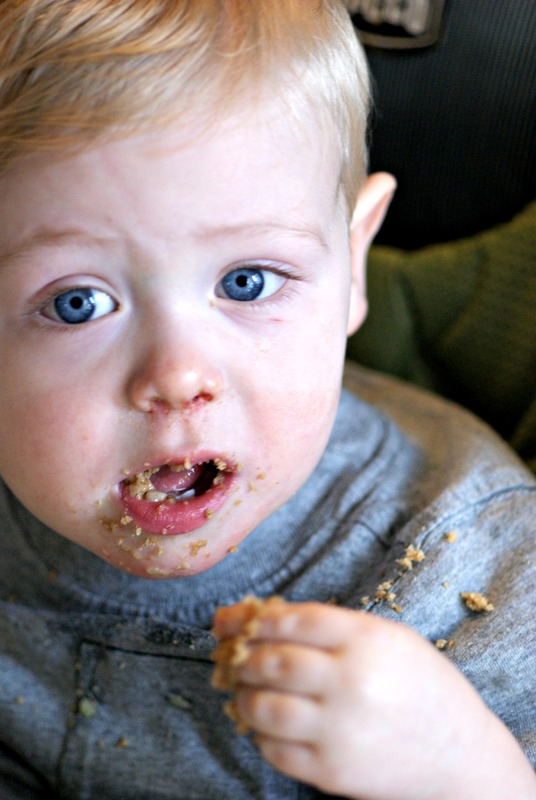 Because of the kids allergies, we can’t really eat at too many restaurants. Even if there are meals on the menu they can eat, they usually have to be heavily altered and they have sneaky ingredients [MSG is no friend of mine]. This has lead me to be a diaper bag and lunchbox [who am I kidding? It’s a lunch TOTE] carrying mom. It’s not so bad though. It’s considerably cheaper than eating out and I know what they’re getting. 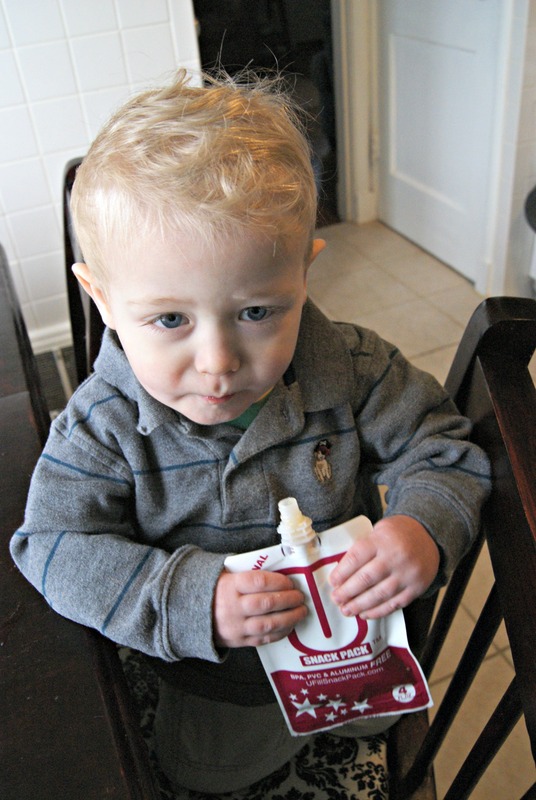 But 18-month-old Landon requires some extra thought when packing a snack for him. He has an uncanny ability to spread, schmear, and wear everything he eats. It is a skill, but obviously not a desirable one. So while we’re working on table etiquette at home, I try to pack him the least messy snacks I can come up with for the road. So to the web I went in search of a reusable pack to fill myself. It actually took me a few weeks to decide which brand to buy [I like to research, a lot]. There are so many options! There are pouches with cute little animals on them. Pouches with large spouts and super lids. 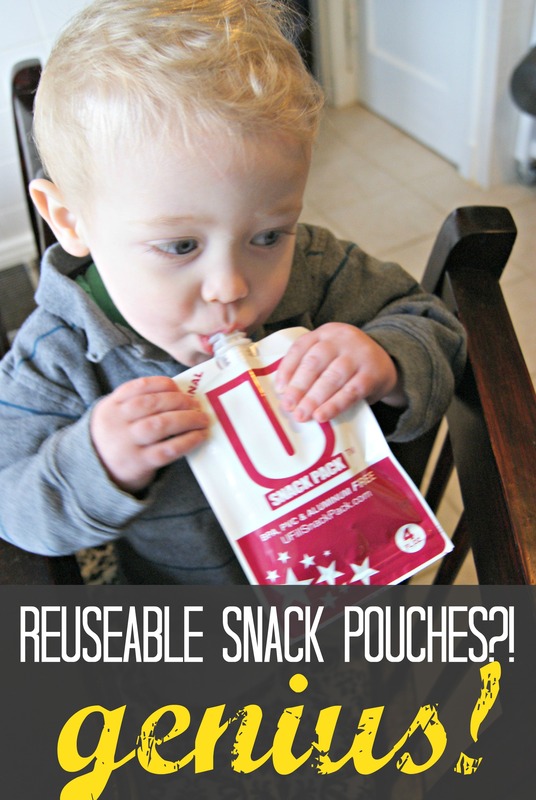 But the problem I saw was that all of the pouches ended up costing between $5-$10 per pouch [How bummed would you be if your kiddo lost one of those!?]. And then I saw the U-Fill Snack Packs [cue spotlight and intensifying music]. After factoring in shipping they came to about $2.50 a pouch and they were the same shape as the pouches we were already buying so I knew the kids would have a smooth transition [you have to think about these things!]. The pouches came [I bought a pack of 10] and set up was pretty easy. I just snipped the bottom off and rinsed it out with warm soapy water. You fill them up from the bottom and then there’s a super zipper to close it up. I also noticed, and I don’t know if this is just by chance, that the line on the bag where it turns from white to maroon is the perfect place to fill up the pouch to get your 4 oz in without filling it up too much so that it wouldn’t close. The caps are also the same as the pouches we were buying. In fact, I tested out one of those disposable caps and it fit on my U-Fill should you lose a cap and not want to buy a whole pack of replacement caps [reduce, reuse, recycle!]. I’m having a super friendship with my pouches. We take them everywhere. I haven’t made any veggie purees to try in them. For now, we’re just keeping it simple with applesauce and yogurt. And as an added bonus I can fill them with unsweetened, organic applesauce for less than I was spending for sweetened, conventional [and apples are at the top of the dirty dozen list so going organic with them is a great idea]. It also occurred to me that I can pack these for the adults when we go hiking, running, or cycling. I haven’t tried it yet but I’m dreaming of a puree of brown rice and sweet potato during a workout [go carbs!] or a banana with protein powder mashed into it for your recovery [go protein!]. How about putting some extra of your morning smoothie in a pouch [Am I the only one who always makes too much?!]? Really you could add anything as long as you’re keeping it about the consistency of applesauce. And I love that because have you tried those goos and gels? They’re seriously gross and creep me out. So, like I said, totally fast friends with the U-Fill Snack Packs. In fact, I contacted them and asked if they would consider sponsoring a giveaway so that one of you guys could try them out, too. And what do you know: they agreed! Yay! 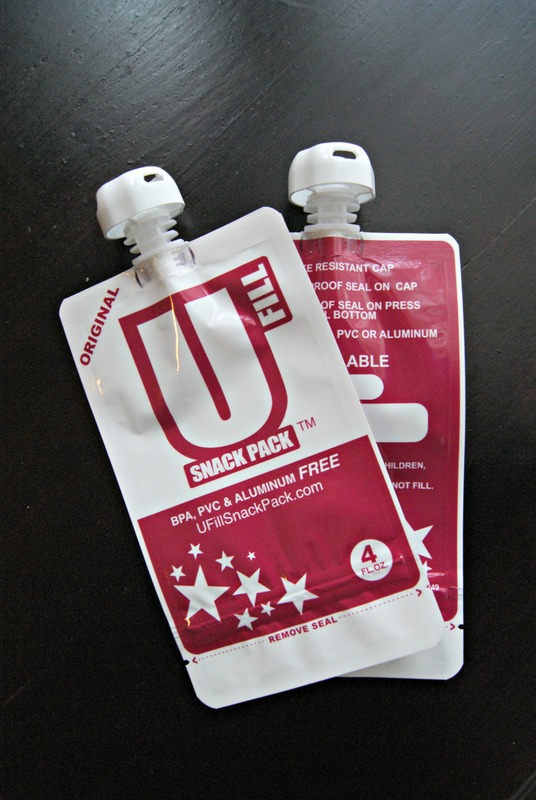 Up for grabs is pack of SIX U-Fill Snack Packs. So the rules are similar to the last giveaway: simply share this post on your favorite social network [facebook, twitter, pinterest, etc.] and leave a comment here telling me where you put it. The giveaway is open to the U.S. and we’ll keep it open until February 19, 2013 at 8 p.m. CST. Good luck! Disclaimer: I purchased my set of U-Fill Snack Packs on my own and liked them so much I contacted the company asking them to offer some up for this giveaway. They graciously agreed and here we are. They’re just too great not to share. Oh my goodness, SO EXCITED about this! I have been seeing several refillable pouches out there but 1) they have been really expensive and 2) the design didn’t seem quite right – either too hard to fill/wash or too hard to get all the food out while eating. These look like gold. Sharing on Facebook … NOW! I tweeted about the giveaway. I love your blog especially for recipes. My girls have lots of food allergies too, so I can definitely understand having to carry around your own snacks all the time too. Im going to share this on my Facebook page! I am totally ordering some of these for my parents to bring down when they visit us in a week and a half. Thanks for posting. I have looked before but got cross eyed trying to sift through all the options. Thanks! I’m not a mom and I love this idea! And good to know for some long, far-off day down the road. I love your ideas for putting protein and a mashed banana or extra smoothie, I hate getting hungry while on trips or running errands! Genius :) Will be sharing on facebook for all my new mom friends to see! Those look awesome! I just shared on facebook and pinned this on pinterest! 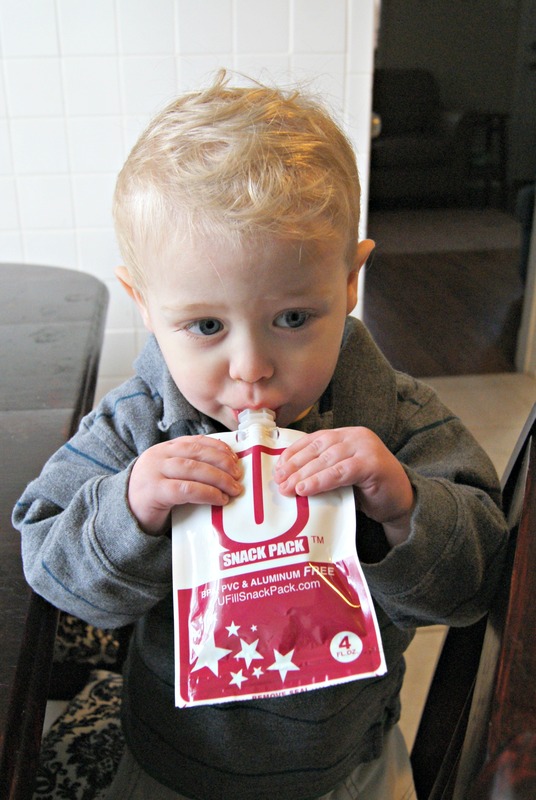 I’ve been looking for a clean way for my daughter to eat applesauce on the go and this looks like the perfect solution! I love the idea! I’ll have to bookmark this page for future reference. I’m trying to spread the word on facebook too! I shared on FB and Pinned it! I saved this to the pinterest board I have dedicated for stuff for my sister in law. I also sent it to her FB! awesome! I hope i win. i shared on FB and pinterest. This is Jessica G’s entry. She shared on facebook. Happily pinned it. Awesome giveaway!